Classified as a Late Victorian style, it was designed and built by Robert Gee, 1890.
broker and investor, under the name of Star Investment Company in 1914. Mr. Carl Knapp bought and lived in the east side of the building in 1923. Knapp was a cargo supervisor for McCormick Shipping Company. He lived here into the 1960s. There were several subsequent owners before the current owner purchased the property in 1998.
windows remain. The exterior was resided with "raked shakes" in the 1960s. There are two recessed front porches with tongue-and-groove floors. The original spindles and balustrades were removed during residing and the shakes were extended down in an arched effect in the 1960s. Brackets above the cut-away portion of the bay windows were removed, but the fish scale shingles survive under the shakes on each of the gable ends. There is a rear addition constructed c. 1940s as estimated by stylistic features. The interior floor plans of each unit mirror each other. The original woodwork remains throughout much of the house, including picture molding, tongue-and-groove Douglas-fir floors underneath more modern floor coverings, window an door surrounds with bulls-eye corner blocks. The arched openings were between the foyer, parlor, and dining room were installed during the 1930s when the openings were widened. the decorative woodwork. The Simon Abraham Duplex is significant for its rarity as a late 19th century building, a rare building type as one of few duplexes built during this period, and for its association with the social history of the area. removed along with all corner trim. During proposed restoration, the trim and some ornamentation is planned for replacement. gabled cut-away bay window. Sandwich brackets above the cut-away portions were removed during residing. Fish scale shingles survive underneath the shakes on each gable and planned for restoration. Between the bay windows is a recessed area with two simple double-hung windows that light the bedroom on each side. many Victorian structures. On each side, a narrow sidewalk runs against the side foundation to the rear. On the west side, a back door is at the north end of the west facing wall of the rear addition. On the east side, there is a small single pane window near the north end that lights the foyer area. The corresponding back door is in similar placement but the addition setback is only 5' instead of 12' on the west side. The east side also differs due to a subterranean door at the south end of the addition for basement access. this side is shallow and shed like. Some of the wooden windows have been replaced around the 1980s with aluminum frame counterparts but retain the same configuration. At the southeast corner, short sets of 1940s vintage double-hung windows remain. sides. Immediately to the left inside the nook is a door leading outside to the backyard. The Simon Abraham Duplex of 1890 sits on the plat of the Townsite of Albina. On 28 May 1873, the plat of Albina was filed with the county by Edwin Russell and George H. Williams on a donation land claim originally settled by J. L. Loring and Joseph Delay. (2) Russell was an ambitious businessman who saw a vision of a thriving city on the other side of the Willamette and managed a bank in Portland. He got a contract with the U. S. government to establish shipbuilding yards but borrowed heavily. He went broke in 1874 after a depression affected the banking industry and commerce and moved to San Francisco. On 12 December 1890, Peter Severson sold the property to Simon Abraham for $3000. Simon Abraham was a German born barber who had a shop on Front Avenue. He may have planned the duplex as a retirement residence since it was on the eastern edge of development at this time. Within a few years, he moved into the westerly unit (408 San Rafael, old address, now 522 NE) with his wife Pauline. Simon Abraham was born in Germany around 1840 and immigrated to the United States in 1875. He rented the easterly unit (old address 410 San Rafael, now 530 NE). (8) On 11 December 1907, the Oregonian index stated he died at a reported age of 58. A few months previously, perhaps due to ill health, Simon and Pauline Abraham sold the duplex to M. Glenn Osterhout for $4000. Mr. Osterhout was a storekeeper for Portland Railway, Light & Power Company. He purchased the duplex as an investment and lived at 455 W Park (old address), and later listed as the purchasing department manager for that utility. In 1914, Osterhout sold his rental property to Herman Moeller under the name of Star Investment Company. Mr. Moeller was a mortgage broker in addition to managing and owning investment properties. He lived at 1542 SE 25th. 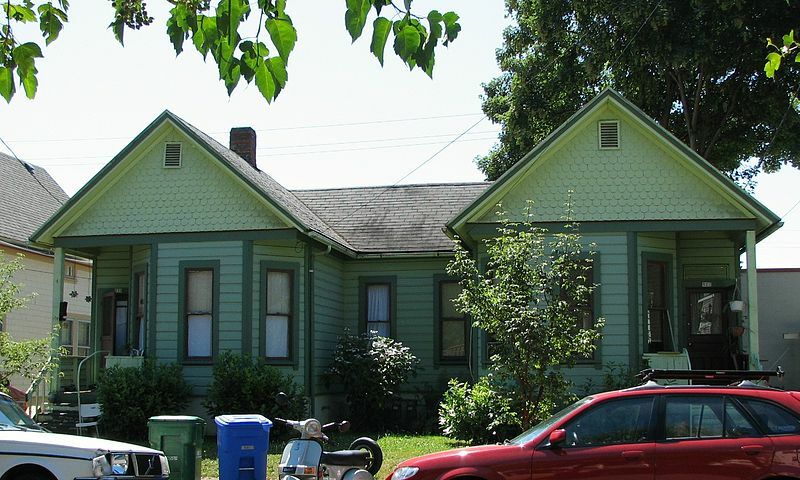 In 1923, the duplex was sold to Carl W. Knapp who moved into the 530 side, Mr. Knapp was a cargo supervisor for McCormick Shipping Company and remained in the duplex into the 1960s. (4) Since then, it went through several owners as an investment property in run down condition until sold to the current owner in December 1998. 1. HacColl, E. Kiibark, The Shaping of a City: Business and Politics in Portland, 1885-1915, Portland, OR, Ihe Georgian Press, 1976. 2. Hultnoian County Deed Recordings, 1884-1914. 3. Oregonian, 21 January 1919, p. 11. 4. Polk Conpany, Portland, East Portland, & ftlbina Directories, 1885-1940. 5. Portland Historic Landiarks Coiiission, Multiple Property Subiission for the Eliot Neighborhood, 8 Oecenber 1991. 6. Portland Buildings Bureau, building and plusbing periits. 7. Sanborn Fire Insurance Haps: 1901. 8. United States Census of 1900.